I’m leery of books on writing, especially if they’re written by an author I’ve never heard of. If someone is going to give me counsel, I want it to someone who knows what they’re talking about, someone with real-world experience, someone who’s broken out and had substantial success. Getting published, after all, isn’t easy. 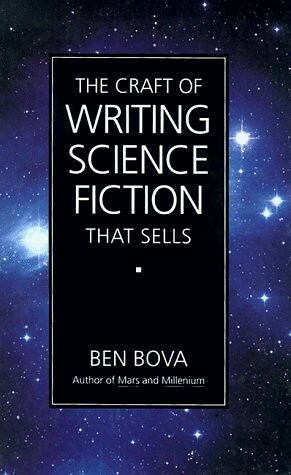 The point is, it’s hard to find a good book on writing, which is why I was delighted to read Ben Bova’s The Craft of Writing Science Fiction That Sells. Don’t let the name fool you. This is a book for fiction writers of any genre. In fact, I wish Bova had titled the book differently so as not to dissuade writers of other genres from picking up a copy. Bova, as I mentioned recently, is a master of science fiction, and sufficient emphasis is given in the book to the challenges of that trade. But what Bova says about character and plot structure and conflict and the necessary life habits of a writer apply to all fiction writers, be they authors of mysteries, romances, westerns, whatever. I’m no writer of science fiction. I hope to be—or at least a writer of suspenseful fiction. And I found Bova’s suggestions invaluable: never solve a problem until you’ve introduced two more; write every day and don’t let hell or high water stop you; plant a “time bomb” on the first page; create antagonists, not villains, heroes of their own stories, etc. If you’re interested in writing stories, I highly recommend this. Also check out Orson Scott Card’s Character and Viewpoint and How to Write Science Fiction and Fantasy. All three books are great resources on the art of successful storytelling. As is, I’m told, the latter half of On Writing. But don’t quote me on that last one.